Guests at Cinnamon Lodge enjoy wilderness pack trips, raft trips, guide service, hiking and backpacking, snowmobiling, and cross-country skiing. Downhill skiing is available at nearby Big Sky of Montana. Other activities include horseback riding, hunting, fishing. A cafe is also offering authentic Mexican cuisine, mouth watering Montana steaks, barbecue burgers and more. Serving dinner, 4:00pm to 10:00pm. For western dining at its best visit Cinnamon Lodge. We provide log cabins that are fully furnished with baths and kitchens. 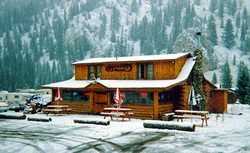 A restaurant offers excellent dining and western atmosphere. We also have a full-service bar, and corrals. Our lodge is surrounded by majestic beauty and is close to all. Directions: Cinnamon Lodge is a year-round resort located on the Gallatin River, six miles north of Yellowstone Park and ten miles south of Big Sky resort.